Students from A.B. Ellis Public School purchased toys for the Lions’ Christmas Toy Drive in Espanola, including, from left, Mckenna Perlin, Abigail Phibbs, Cori Gracia Perez, Zena Pregent, Grace Selinger, Perlin Foo and Madalynn Soltys. "Our students have special activity days throughout the year such as pyjama day, hat day, and school colour day," says Principal Lynn MacDonell. "There is a voluntary donation from students to participate. This money is collected and the Espanola Lions match whatever we raise each year." With the matching donation, the students were able to purchase $1,100 worth of toys, an impressive contribution to the children of the community of Espanola. "Giant Tiger gave our school a 10 per cent discount, so the dollars raised went that much farther," says Principal MacDonell. 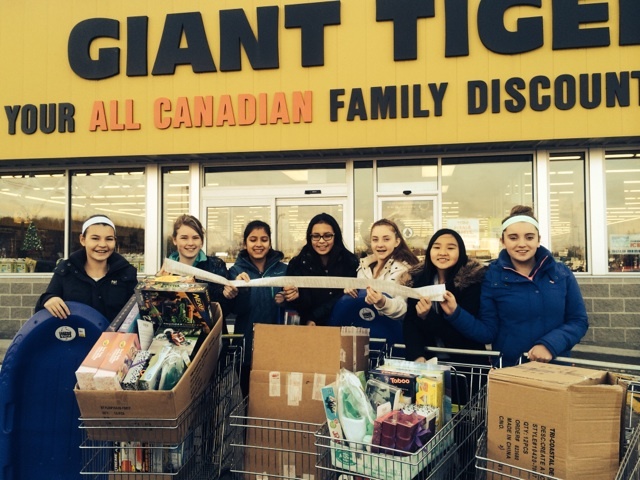 "We thank the Lions Club and Giant Tiger for working with us to share the festive spirit."